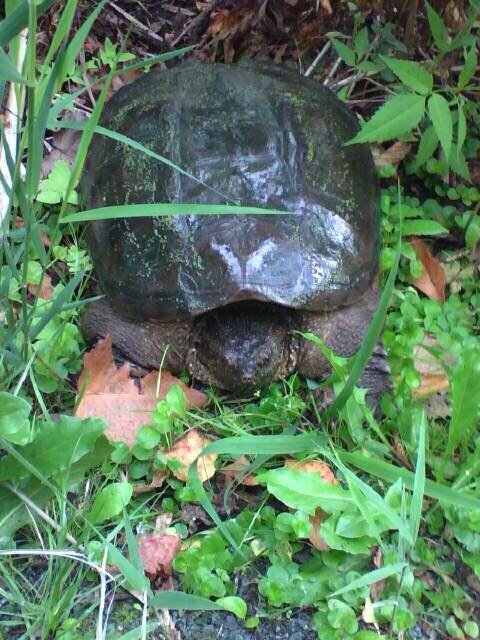 Yesterday on my morning walk I ran into this snapper at the edge of Buckingham Lake. 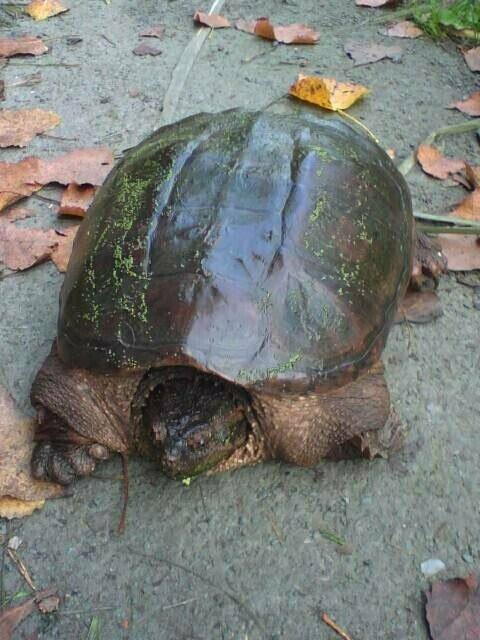 It may be a bit difficult to gauge size, so I should mention her shell was about a foot long. Clearly not in a hurry: on my first lap around the lake, she had just got out of the water. On the second go-round, she was sitting on the path. Maybe she was just posing! Previous Post BitchBuzz: It Makes You Gay! Gorgeous! I saw one walking along the same road I encountered the cow the other night driving home…. Ah, the Connecticut countryside! So bucolic. At my parents' DC 'burbs home, I once watched a box turtle lay her eggs next to the garage and laboriously cover them with dirt. This taking some time, I fetched her a piece of lettuce, in which she chose not to partake when finished (perhaps the domesticated animals are less fussy about the dead leaves since they might have no option). Something, whether opossum, racoon or human (or even avian or molish) poached the eggs by the next morning, leaving us miniature turtle-free, alas. Circle of life, I guess. But baby turtles! Would have been cute.